Terry E. Gahm’s study of hypnosis began very early, although he didn’t realize it. The son of a true WWII hero, Terry was exposed to one of the most traumatic forms of altered reality that one can endure, a severely debilitating mental disease recognized today as Post Traumatic Stress Disorder. At the time, a PTSD episode was regarded as nothing other than a bad day of bad memories. But as a child, Terry had to live with the truth, a father with two personalities. The first was a charismatic war hero who would entertain and motivate others and could pick up the spirits of everyone in the room. But at home, his father would become a completely different person. A very violent, suicidal ex-soldier with horrific long-buried memories who could not overcome his depression. The only situation that could snap him into becoming the good dad was created by the suspended reality of celebration at an event or party, where the entertainer war-hero father would revel himself to the delight of those strangers around him. As a youngster seeking a way to make his father happy, Terry found a way…music. A straight “A” student (Terry was his high school valedictorian), he chose to dedicate all extra time to the study of music. Gahm left the service disgusted and distraught. He was discharged as a decorated officer, just like his dad. However, just like his dad, he also became a disturbed and angry ex-US soldier. Even more upsetting, Terry returned home to the disgraceful treatment that welcomed Vietnam Veterans. So Terry Gahm the piano player went on the road. It wasn’t long before he faced the realization that simply playing music couldn’t bring him the happiness it had when he was young. The events of the war still haunted him. “I learned that just pretending I was happy wouldn’t work, I had to talk about it. I needed to tell others what a lie war was and what loyal military service really did to our soldiers.” Terry moved to New York City and became e.g. Terry, a politically angry comedian. His therapy became making fun of the hypocrisies of war, big business, and government. 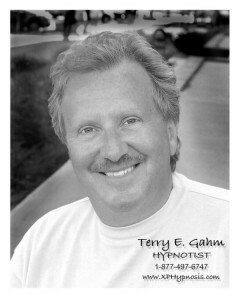 Terry E. Gahm has studied extensively, and continues to study with the greats in the world of hypnosis. Mentors like Ormond McGill, Gerald F. Kein, Robert Kennzington, and many others have all contributed their own individual elements to Terry’s incredible and masterful presentation: It’s Amazing! The Minds of America!